Hypertension - Renal Denervation - Dr. Apostolos Tzikas MD, PhD, FESC. Hypertension - Renal Denervation - Dr. Apostolos Tzikas MD, PhD, FESC. Normally, circulation (flow) of blood from the heart to the periphery (musculature, organs, etc.) requires, besides the driving force of the heart, the existence of pressure within the arteries (blood pressure). Blood pressure has two main parameters, systolic (“upper”) and diastolic (“lower”) pressure. The normal systolic blood pressure is ranging from 90 to 140 mmHg, and the normal diastolic blood pressure from 60 to 90 mmHg. When someone is at rest and, after repeated measurements, his blood pressure is higher than normal that means he suffers from arterial hypertension. Hypertension can be primary (90-95% of cases) or secondary, depending on the reasoning. When, despite receiving at least 3 antihypertensive drugs, blood pressure remains above normal then it is called resistant hypertension. Hypertension is a very common condition and is an independent risk factor for various diseases of the heart and blood vessels (coronary heart disease, stroke, kidney failure, etc.). Primary (or idiopathic) hypertension is not due to a specific medical cause. It is related, to some extent, with increasing age and is the result of a complex combination of genetic (hereditary predisposition) and environmental (obesity, smoking, alcohol consumption, etc.) factors. Secondary hypertension is due to a specific medical cause such as kidney, adrenal, thyroid disease, congenital heart disease like aortic isthmus stenosis or even medication such as anti-inflammatory drugs. Arterial hypertension is rarely accompanied by symptoms. In some cases it may appear as occipital headache (neck pain), dizziness, vertigo or tinnitus (ringing) in the ears. The diagnosis is made by measuring the blood pressure with a pressure meter (analog or electronic). In order to measure the pressure properly, one should be in a comfortable, cool environment he should be relatively calm and relaxed, and he shouldn’t eat or consume alcohol 2-3 hours before testing. Repeated measurements over a week are needed. Also, it is important that the pressure meter works properly and, if it is an analog device, that the one who makes the measurement is trained appropriately. For patients suffering from resistant hypertension, i.e. when despite taking at least 3 anti-hypertensive drugs blood pressure remains above normal, there is a new invasive therapy. This is the denervation of the renal arteries (renal denervation, RDN) using a special catheter. 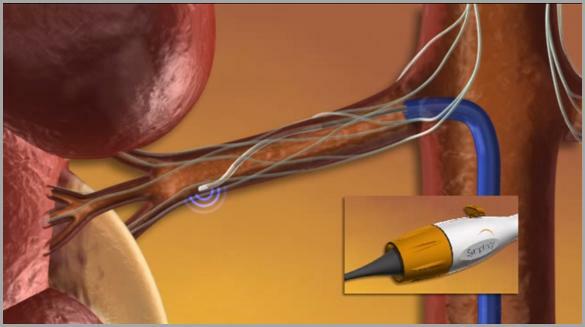 It is done by catheterization of the femoral artery (such as a coronary angiography) and the initial results are very encouraging both in terms of safety and efficacy.